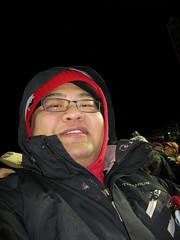 Went to the 2011 NHL Heritage Classic featuring the Montreal Canadiens and Calgary Flames. Kudos to majestic_12 for tickets. I ended up taking my baby brother, Wayne to the event. It was cold. Might have been -13*C outside, but that wind made it feel -25*C. I need to remember to wear winter boots next time around. We left the house around 3pm, giving us an hour to go two train stations down, but didn't end up getting in to the Stadium until almost 4pm. It was packed. I've been to football games down there, but it was madness to see how many fans there was. The pedestrian overpass to the stadium was packed and backlogged all the way to the train station. It was a sight to see. Young and old, everyone was there. Security was tight, or at least that was the impression with gates herding us like cattle. It wasn't very well setup. By the time, we got around, they were trying to get through as fast as we could. Our tickets were in section B, so that means we had to walk around the concourse to get to our seats. Definitely a challenge trying to push through the sea of people, beer vendors, and 50/50 ticket holders. Finally, getting to our seats, we got some padding, and dressed in multiple layers we sat down and caught the game. There was a bit of a delay with the ice, and so that helped people a bit. Heard the American anthem, which considering it was two Canadian teams was pretty odd. Saw lots of different jerseys, from the now-defunct Winnipeg Jets, to Atlanta Flames, to lots of Boston and Philly fans. That's not including the substantial Montreal Canadiens' contingent. Some great entertainment throughout the game. We had Five for Five for Fighting (pre-game), country music singer Paul Brandt (Canadian national anthem) in the Heritage Classic jersey, country music duo Thompson Square (U.S. national anthem), and fellow rockers Tokyo Police Club (first intermission). Wayne and I missed hearing Tokyo Police Club in the first intermission, as we were in the line for food. We needed some protein. Wayne was shaking and shivering quite a bit, despite the layers he had on. He was doing better after the food, and so was I. I think I was less cranky. Nothing like a double cheeseburger and a spolumbo's sausage dog to get the body going. We sat nearest where the Canadiens were entering the building. Everything was facing away from us, but still decent view. Definitely great to be part of the experience. I picked up some gear at the store, so it was a bit of a pricey weekend, but I can't imagine I'll be going to another one of these. Lanny McDonald and his grandson were part of the ceremonial puck-drop, so that was nice to see. Didn't see any streakers, though, I think the weather and larger than average police presence was a good deterrent. You could tell the ice wasn't so great. A bit chippy, and it was like a road game for both teams. I was worried when the Canadiens had a better jump and were moving around a little quicker early on. Fortunately the Flames lit up the net a few times early on, and got going. It was funny, there was a sizable contingent of fans in the section A, that just got the wave going by the third period, and you could see everyone around the stadium just mesmerized. I think people got the hint that if you stand up and then sit down, its good to get the circulation going. For about 5-10 minutes in the 3rd period when the game was already out of reach for the Canadiens, Wayne and I were just watching the wave go around the stadium. It took a while to get it going, but nothing like the motivations of a few drunks to get it along. You could see people in each section trying to encourage their group along. The celebrations started early, and you could really feel part of something special. People high-five-ing each other all the way to their cars. Brought me back to feeling of the Stanley Cup run in 05? We knew traffic and the trains were going to be packed, so we ended up walking home. Took a bit, but we made it. Felt a lot warmer as we were moving around. Saw some people with sleeping bags, but most were bundled similarly to us. I think getting a down jacket will be my next winter purchase. Interesting Rule Change, is that at the 10 minute mark of the 3rd period, they blow the whistle and change sides, to balance the lighting in the stadium. I guess its an outdoor rule. Kinda weird, but I'll take it. We had an annoyed Canadien's fan with a huge homemade sign in front of us. Drove a whole bunch of us mad. I almost took it away, but restrained myself. Funny enough though, seemed like everytime he was hoisting the sign, the Flames scored!. That wasn't the end of my night. silvenwolf grabbed me out of bed to have a late, late midnight dinner at BPs. It was a good time. If you would have saw us, you would have probably thought we were drinking. I'll have to be mindful to try not to make her laugh some much when driving. Some stories are just that funny. No worries. Hopefully Flames can keep up this run!